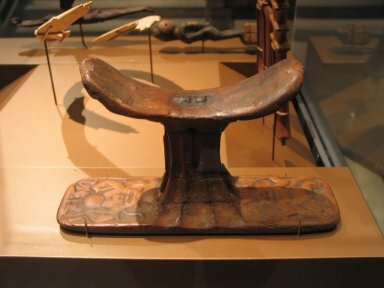 Wooden headrest made of four piece of wood; top, two pieces in supporting pillar, and base. The pieces are pegged and tenoned together. At either end of the base are two crudely executed relief representations of Bes. At one end he holds plants; at the opposite end of the base he is represented holding snakes. Busts of Bes, in relief, decorate the undersides of the tips of the top piece, and in each case he holds a papayrus-scepter the stem of which descend down the support. Condition: Numerous cracks and chips; reliefs seem worn.